As electric power is increasing in popularity for model aircraft locomotion due to significant advances in motor and battery technology, internal combustion engine use is decreasing - at least as a percentage. 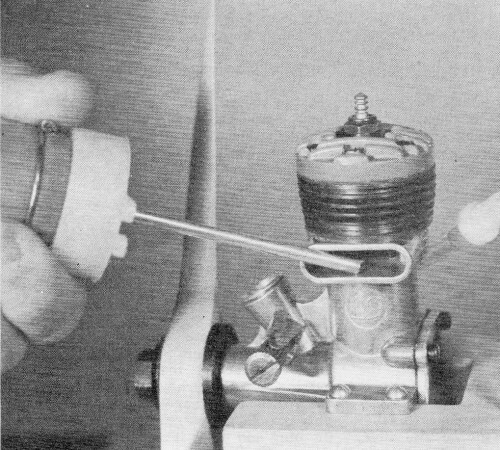 For those modelers who still indulge the often temperamental habits of those engines, this article from the American Aircraft Modeler's For the Tenderfoot series is a good primer on how to break in and adjust them for long life and reliable runs. 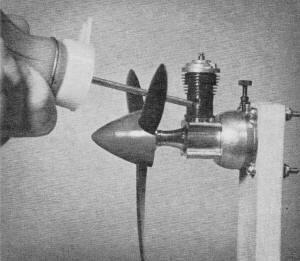 My own conversion to electric power has been purely for the sake of convenience; there is no substitute for the sound and smell of a model airplane engine screaming away with the fragrance of hot castor oil emanating from the exhaust port. Engine starting, operation, break-in, and trouble-shooting is a matter of technique and practice. Here's how an expert does it. Gentlemen, start your engines! Each Memorial Day this cry, echoing across the Indianapolis Speedway, brings a score of racing power plants roaring into life at the start of the Indy 500. But, on the model airplane flying field, such is often not the case. 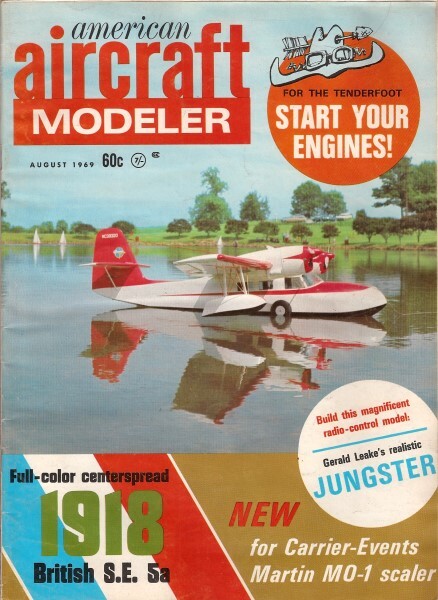 The Tenderfoot, who has just bought his shiny, new model airplane engine, is having his difficulties getting it to run. As frustration sets in, and the Tenderfoot and his Dad are about to decide that they're stuck with a lemon, an Old Modeler enters the picture. The Old Modeler goes through a few motions, flips the propeller a couple of times, and the previously obstinate engine leaps into life and purrs like a kitten. "Now, what did he do that I didn't?" wails the Tenderfoot. 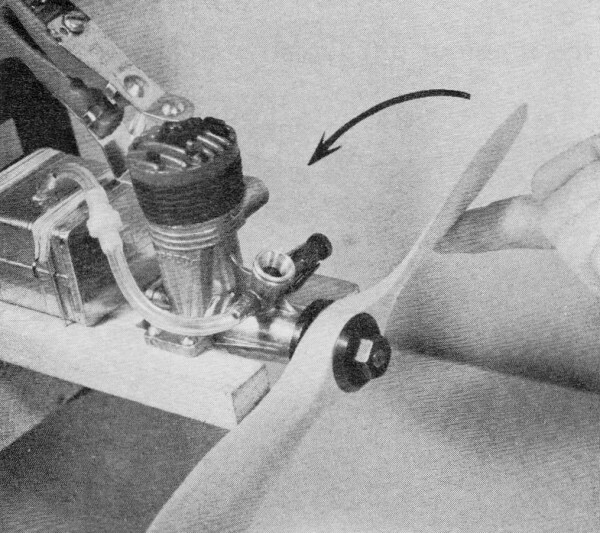 With engine mounted on a board clamped to an outdoor bench, practice starting and adjusting it before mounting it in a plane. 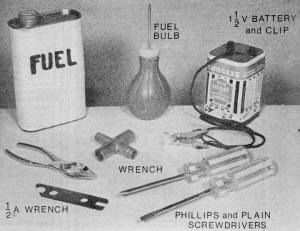 Use fresh sport fuel, new battery, clean glow-plug clip, and have all the tools for your engine. The wrench is by Austin Craft. Tank size is chosen for convenience only, but note that the tank is about even horizontally with the engine's needle valve. Bolt a radially mounted 049 engine to a sturdy piece of wood which is then clamped in the work-bench vice. Priming method shown. When priming the larger engine, place the prop so that the piston is at its lowest position, squirt a few drops into the cylinder. Choking the engine means closing the intake or carburetor opening with your finger, while holding and rotating the prop a full turn. Opening the needle valve will run your new engine slower with a rich mixture. It will run cooler and have more lubrication. Engines do backfire and fingers can get cut. 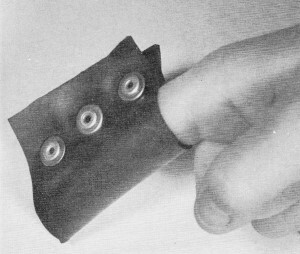 A simple inner-tube rubber finger guard is easy to make. 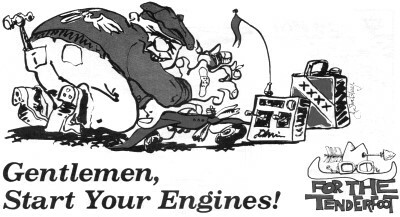 Use it on all sizes of engines. 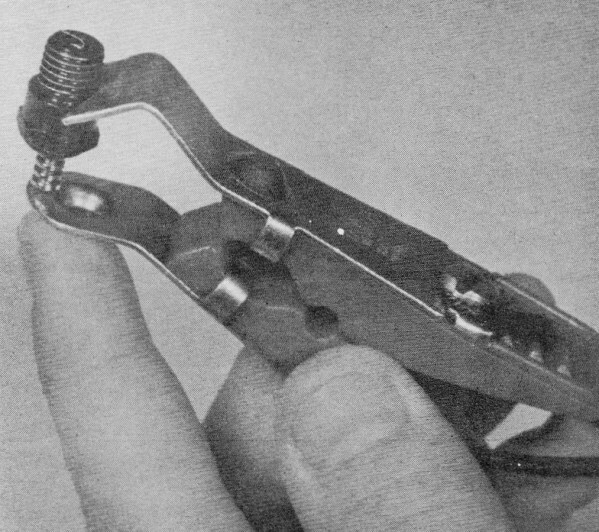 Set the needle valve per article, then clip and flip. With finger behind prop. pull across forcefully as quickly as possible each time. With engine running, adjust needle valve. To run faster turn valve clockwise. This leans the mixture by reducing the fuel flow. Check the plug if the engine won't start. If it lights up, then both the battery and plug are good, but if not, check the battery. Try new plug only if your battery is good. Always use wrench when installing plug or tightening prop nut. Just get plug snug. In this article, we'll try to give you the answers to his question. Any experienced modeler can tell you that there's no real difficulty in operating a model airplane engine. You just have to attend to some details. Properly cared for, all modern sporting-type engines will start easily and consistently, will run smoothly, and will have a long and satisfactory life. So, to get started properly, study the accompanying photographs as well as this article. We've based the photos on a popular sport-type engine. However, the principles are applicable to all conventional model airplane engines. In addition to the how-to-get-started photos, we've included ideas on what to do if the engine seems not to want to start. And we've included a few pointers on operation to assure a long and useful engine life. If you have a new engine, remember that all new engines require careful break-in if they are to continue to give reliable operation. So, please be familiar with the section "Breaking in the New Engine" before you set out to start it for the first time. Take it easy, don't overspeed it! There'll be time, later, to demonstrate its high performance. A few starting pointers: Priming causes most beginners to stumble. A couple of turns of the prop with the air inlet choked, plus a few drops of fuel in the exhaust port is usually all that is necessary. Some engines may require only the initial choking, while others may require a juicy exhaust prime. You will need to become familiar with your particular engine. When you start flipping the propeller and hear a mild "pop" every flip or so, the engine is trying to start, so keep cranking! A new engine can be stubborn and may require quite a bit of cranking before finally catching. So don't be discouraged if it doesn't fire right away. Many perfectly good engines have been returned to hobby shops because their inexperienced owners did not recognize this trait. The experienced modeler's trick - to tell when the engine is ready to fire - is a useful one. Don't worry about the propeller being pulled out of your hand; the explosion force isn't that powerful if you have a firm grip on the blade. When you feel the light "catch," a few flips should have the engine off and running. When your engine starts it probably will run roughly, emitting much blue smoke and raw fuel. That's because the needle valve is set too far open (too rich). Close the needle valve slowly (rotate clockwise) and the engine will start to run smoothly. 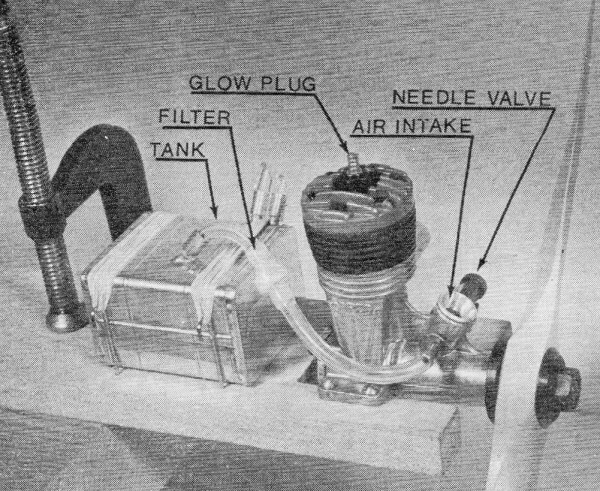 Disconnect the glow-plug clip. If the engine slows, the mixture is still too rich, so reattach the clip and close the needle valve a touch more until the engine runs smoothly with the glow-plug clip removed. As you close the needle valve further, the engine will speed up and reach a "peak." Beyond this peak, as the needle valve is closed further, the engine will slow again as the mixture be­comes too lean. Are the battery wires loose, at the battery or at the glow-plug clip? Is the battery run down? Are the glow-plug clip contacts clean? Dirt there can prevent the current from flowing. s the fuel line kinked so the fuel won't flow? Soft rubber tubing often does this. Is the line loose from the engine or from the fuel tank? Has the fuel line contacted the hot cylinder and burned a small hole in the tubing wall? Is the propeller positioned correctly? Is the propeller secure on the shaft? 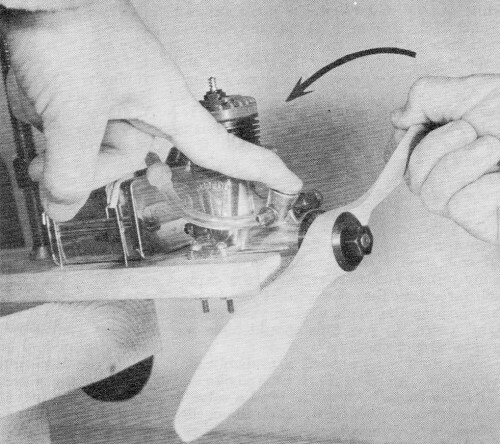 Are you using the propeller recommended in the engine instructions? An over-large propeller can be too heavy for the engine to swing. If your starting preparations and these points show up O.K., then it's time for serious trouble-shooting. Needle valve set too lean: A quick, screaming burst, followed by a sudden stop means that not enough fuel is reaching the engine. All it's doing is using up the priming fuel. If the fuel line isn't kinked or loose, open the needle valve another turn and try again after repriming. 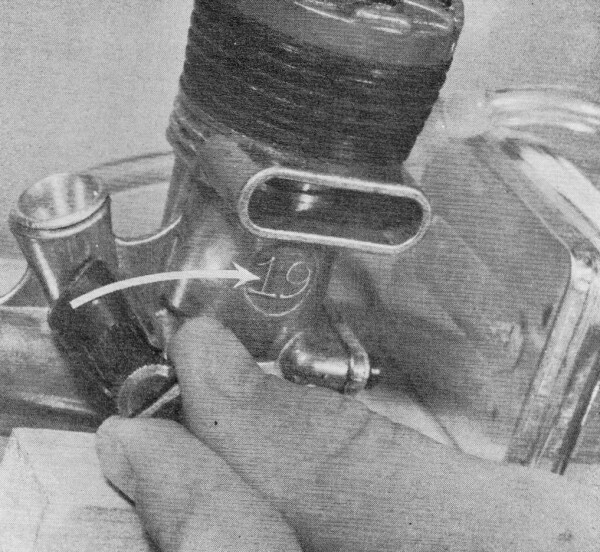 We've found a few individual engines that used needle-valve settings quite different from the manufacturer's recommendations. Dirt in the fuel supply: If the engine still runs out the prime and quits, check for dirt clogging the fuel line or the needle valve. 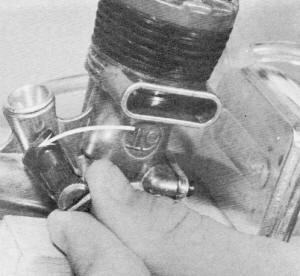 If you're using transparent fuel line, inspect it carefully for specks of dirt inside, particularly where the tubing joins the needle valve. These particles can come from several places. An over-aged fuel bulb may be starting to shed rubber crumbs into the fuel as you squirt it into the tank. If the fuel tank is an old one, it probably has dried fuel residue in it, which flakes off when the new fuel hits it. And dirt may have drifted into your fuel can. Reputable fuel manufacturers are carefully clean, but if you let the fuel can sit around with the cap off, dirt will get into it. Save yourself a great deal of trouble by using a filter between the fuel tank and the engine. Clean the filter after every flying session, being careful not to lose the little screen that's inside and is the heart of the filter. Dirt can be flushed from the fuel line by squirting a little fuel through it with the fuel bulb. Or replace the line with new tubing. 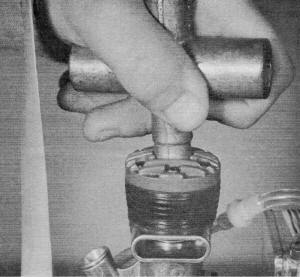 Then, remove the needle from the needle valve and attach the fuel bulb directly to the needle valve inlet. Squirt fuel through the valve to flush out any dirt. To remove dirt from the fuel tank, re­move the tank from the test block or the model and flush clean fuel through it. In the case of a small engine with an integral tank, carefully remove the tank, following the manufacturer's instructions, and flush it out with clean fuel. Just be careful that you don't introduce more dirt than you remove! Loose parts: After several cycles of the heating and cooling to which a model engine is subjected, cylinder-head bolts and crankcase bolts and glow plugs become slightly loose. This looseness can cause the engine to leak enough to prevent starting. Tighten them up (with the correct screwdriver or wrench), including the engine-mount bolts, before and during each flying session. 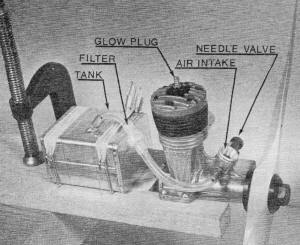 If the engine quits after the glow-plug clip has been removed, the plug may not be holding its glow in the heat of the combustion chamber. It may be just "tired" from over age or too much high-speed, high-temperature running. The only cure is a new plug. Sometimes the glow-plug element, through use, gets against the plug wall and causes a short circuit. If this appears to have happened, gently use a straight pin to pry the element away from the plug wall. This may restore the plug and save you 50c. Always follow the engine manufacturer's recommendations for glow plugs. Small engines usually take short plugs; large engines usually use long plugs. 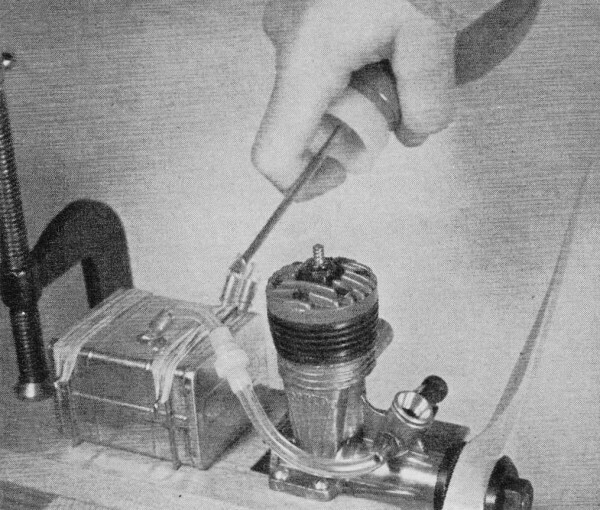 A long plug in a small engine can interfere with the piston travel, at the least keeping the engine from starting and, at the worst, damaging the piston. Flooding: Probably the most common cause of starting difficulties is flooding. This means that there is so much raw fuel in the engine that the fuel-air mixture reaching the combustion chamber is much too rich. This mixture won't burn properly, and also tends to quench the glow plug. Flooding is caused by over-priming, or a too-open setting of the needle valve, or both. It can usually be recognized by the raw fuel being thrown out the engine exhaust and being spit back through the air inlet when the propeller is flipped. A light or moderate flooding condition often will clear itself by evaporation while you're checking the glow plug, fuel lines, etc. So, after making these preliminary checks, it's a good idea to try a start with­out any prime, on the chance that there's enough fuel remaining in the engine for a start. A lightly flooded engine may emit one loud "bang" and stop when it is cranked. Invariably, the force of this backfire has loosened the propeller. Remove the glow-plug clip, reposition the propeller, reattach the glow-plug clip, and try again. If the engine doesn't respond after a dozen flips, reprime and try again. If it still won't cooperate, check the glow plug; the force of the backfire may have damaged it. Disconnect the fuel line and close the needle valve. Crank until the engine starts. It will run roughly for a short burst and quit. Continue cranking until the engine fires again, runs longer, smoother, and then stops. Reconnect the fuel line, open the needle valve, and proceed to start as usual. In cases of very heavy flooding, remove the glow plug and invert the engine, keeping the inlet low. Rotate the propeller by hand and fuel will flow out the various openings. Loose needle valve: If the engine starts well, and runs for a while, and then starts to slow or run erratically, check the needle valve. It is probably loose. If the spring clip that retains the needle is not tight enough, the needle can vibrate open or closed. Sometimes the spray-bar, into which the needle valve screws, becomes loose in the air inlet and turns so that its spray hole no longer points down into the engine. Reposition and tighten these parts, making sure that the spray hole points directly down the air inlet. Breaking in the new engine: If you are starting with a brand-new engine, don't try to get top rpm's from it until it has had a chance to break in. All you'll accomplish will be overheating and damage to the engine. This damage will not show up right away, but it will show up, eventually, in drastically reduced engine life. There's no trick to breaking in a model engine. Just run it at a relatively low speed for several tanks of mild fuel, letting between each run. The first two or should be only about 30 to 60 seconds. Then, work up through a few runs to full tankfulls. Control-line modelers often put a new engine in a trainer after the first couple of test-stand runs, and complete the break-in program with a rich mixture in flight. The airflow around the engine keeps it from overheating, As before, let the engine cool between runs. As the break-in progresses, the engine performance gradually improves the running characteristics become smoother and smoother, and the engine becomes easier to start. You can tell if your engine is properly broken in by practice-flipping the propeller against the engine compression. If the propeller bounces back, nice and springy, the engine is broken in properly. Operating tips: This may sound like a broken record, but treat your engine right and it'll treat you right. It never hurts an engine to be run slightly rich. On the other hand, it can be quickly ruined by over­heating from flight after flight at high speeds with an over-lean mixture. Don't be fooled by the way engines are operated in Speed, Rat-Race, Combat, or Navy Carrier events. The contestants are demanding the most the engine can give and expect a relatively short life. In Sunday flying, though, there's no need to beat the engine to pieces. Remember, when the model is in flight, the engine receives more air than it does on the ground, so it runs leaner. Therefore, set the needle valve about one-half turn richer than the setting for peak speed on the ground, and it won't over-lean in the air. We shouldn't have to mention it, but every so often someone tries to fly with a nicked or split wooden propeller. For safe­ty's sake, don't! The prop is likely to fly apart. Aside from pieces of wood flying like bullets, the brief, violent vibration that occurs before the engine stops has been known to rip the engine right out of the model. Nylon propellers are popular because of their durability. However, if the tips become frayed, they should be trimmed and the propeller rebalanced. Otherwise, the unbalance will rapidly wear the crankshaft bearing. If you use a "chicken stick" (a short, rubber-padded wooden stick), don't bat at the propeller with it to start the engine. The blow can damage the propeller. If the propeller nut becomes stiff to turn, and you have trouble removing it (the result of cross threading or crash damage), insert a hardwood stick or a broken propeller blade through the exhaust port into the combustion chamber to hold the piston and crankshaft while the nut is turned. Don't use a screwdriver for this; it will damage the piston and cylinder liner. When your model is sitting on the ground between flights, keep a clean cloth over the engine to exclude dirt and grit. Then, after each flying session, as you clean the model, clean the engine. Remove the excess oil and accumulated grit and dust; they have a habit of drifting into the engine's working parts. Plug the air intake with soft cloths or tissue and encase the engine in a plastic bag. Properly cared for, your engine will reward you with many pleasurable flying hours.